As far as traumatic experiences go, it doesn’t get much worse than divorce. In fact, according to the Holmes and Rahe Stress Scale, divorce is the second-most stressful life event behind only the death of a spouse. A divorce signals the death of your marriage and often involves a grieving process similar to the one many people go through following the loss of a loved one. Societal norms and expectations are partially to blame for why divorce is often so harrowing. The family court system is set up in a way that establishes winners and losers in the process and thus conflict erupts. Instead of supporting and celebrating couples attempting to split amicably, we treat divorce like a tragedy. While the decision to divorce should never be taken lightly and all the ramifications should be considered before the decision is finalized, we’d also likely be a lot better off if we looked at the bright side of divorce more often. You should only move forward with a divorce after all efforts to save your marriage have been exhausted, but once you realize there is no other option then divorce should really be considered a positive. There is no feeling more hopeless than being stuck in a dead-end marriage. After divorce, you’re finally free to move forward and establish a life that makes you much happier. Here are some tips that can help you find happiness again after your divorce. Divorce is the ideal time for you to reinvent yourself. You have a new level freedom that you haven’t experienced since your bachelor days. Rather than moping in feelings of loneliness, use this time to try new things that you weren’t able to do while you were married. This is the perfect time to discover new hobbies and passions that can reinvigorate you and pump some fresh new energy into your life. Although the family court system far too often marginalizes fathers, you should keep in mind that a divorced dad is still very much a dad. After divorce, your children need your support more than ever and the onus is on you to step up your dad game and become the best father you can possibly be. Stay as involved in your children’s lives as you can. Talk to their teachers and make sure you know what’s going on at school. Volunteer to help out when you can – that could mean coaching your daughter’s soccer team or serving on the local school board. More than anything, make however much time you have with your kids count by being an active listener and staying emotionally engaged. They’re going to notice whether you’re a dad who truly cares or someone who is walking through the motions of fatherhood. Enjoying this article? Subscribe to our monthly Newsletter! As a father, you want to put your children’s interests first throughout this process. However, that doesn’t mean you should ever neglect your personal well-being. 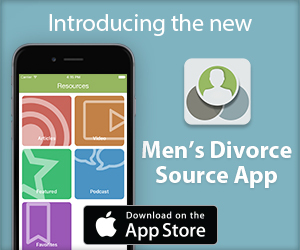 Numerous factors contribute to a huge increase in the health risks men face after divorce. With so much chaos surrounding you, it’s really easy to ignore taking care of your physical and mental health and that can have harmful consequences. Carve out some time every day to exercise as it is proven to be one of the most effective mood-lifting activities. Also make sure you monitor your diet as stress eating can quickly develop into a dangerous eating disorder. Plan out some healthy meals at the start of each week so you ensure you’re not living on a diet of pizza and beer. Finally, make sure you’re getting enough sleep each night so that your batteries are sufficiently charged. The stress of divorce can easily lead to sleep disturbances that have serious side effects such as high blood pressure. Hit the sack at the same time every evening, limit snacks and drinks before bed, and turn off all your digital screens an hour or so before going to sleep. If you experience persistent sleep problems, you should seek the help of a sleep specialist to avoid long-term problems. ← Can A Morality Clause Prevent Me From Dating? Yep and the D process sure stinks, weather you filed for one or find yourself being drawen into one. The best thing that I did was to stay plunged into a good bible teaching church and praying to God. Next was making myself workout, eat healthy, and keep working you need money. Do hire top notch attorneys they can take care of things that you don’t know about or could overlook. Always be a Dad ! Wherever did this misguided contributor find that there is a “bright side” to divorce? Idiotic, unsubstantiated, and just plain WRONG! The jist is to make the best of it….which we should.